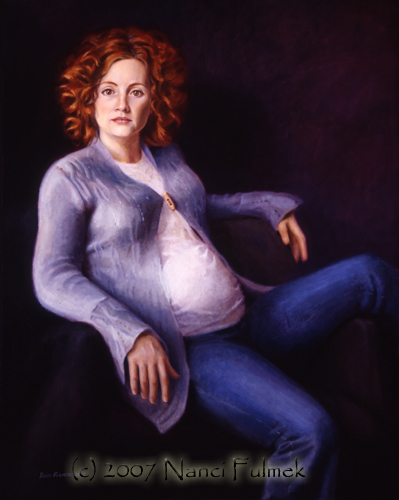 We started this portrait when Leslie just found out she was pregnant. Being that we painted her from life, we had no idea where her "belly" was going to grow. As Leslie was sitting in the chair she looked so causal, so we decided to keep this pose. It is SO HER. As the baby was growing, it was fun to paint, and re-paint some areas, when we were finished she was 8 months along. Leslie was painted 100% from life, even with her body changing every time she came in. Which was once or twice a week. Check out Leslie's after painting, "Good Morning Sunshine".